In case you haven’t heard, Samsung has a new tablet that’s a little different than anything else out there. It’s called the Samsung Galaxy Note 10.1. There’s a 16GB model for $499 and a 32GB model for $549. What makes the Galaxy Note 10.1 different from other tablets is its digitizer and “S Pen” that supports up to 256 levels of pressure sensitivity. This is ideal for note-taking and writing on the screen, along with creating illustrations, cropping photos and a multitude of other tasks. Along with the S Pen, the Galaxy Note has a multiscreen feature that allows it to have two windows, apps, open at the same time. Take a look at Samsung’s video demo below. All tablets should have that feature. The downside with multiscreen and the S Pen, though, is they don’t work with all apps, only with certain apps. 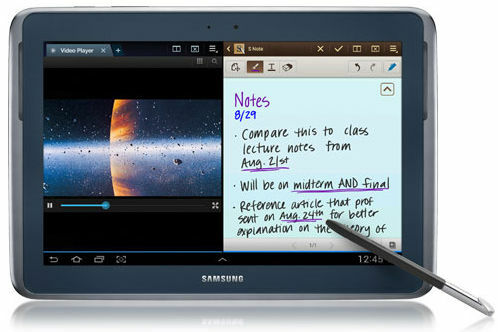 It’s no coincidence Samsung just happened to release the Galaxy Note 10.1 just in time for the new school year. Kno has their digital textbooks available on the Galaxy Note too, making it the first Android tablet to support Kno. Other features for the Galaxy Note 10.1 include a 1.4GHz quad-core processor, 2 GB RAM, a microSD card slot, 1.9MP front camera, 5MP rear facing camera with LED flash, it has Wi-Fi, Bluetooth, USB host, GPS, an array of sensors, and it runs Android 4.0 Ice Cream Sandwich with a dash of Samsung’s TouchWiz. It has a 10-inch 1280 x 800 resolution screen, which isn’t the high-res screen like on the Asus Transformer Infinity. Regardless, the Galaxy Note 10.1 is one nice-looking and unique tablet. It’s good to see Samsung bringing something new to the tablet-sphere. Reviews at Amazon are glowing. Early reviews from tech sites like CNet and Android Community seem to think it’s a pretty nice tablet too, a bit expensive but the best Samsung tablet yet. What do you think? Does the Galaxy Note 10.1 stand a chance? Wow! Is it really that simple to use? Wow, I really like the inclusion of Adobe Photoshop and the ereading multitasking capabilities with video could be used a multitude of ways for ebooks. But yes, the price is quite high unfortunately. I think I want one! Yeah, I’m pretty sure I want one!